Whenever we are aiming to go for a touch screen phone the first thing we are worried about is the on screen keyboard and its disadvantages because most people aren’t comfortable with the on-screen QWERTY keyboard. There are still many people who would prefer regular keypad which enables must faster typing with less mistakes. Also the onscreen keyboard can be annoying for people with large fingers because it often leads to many mistakes and typos. Also the typing speed drops and becomes frustrating. Now you could say that there are many custom keyboards available in android market or Play Store that can make typing very easy and some of them also offer very good large keys that will prevent you from making mistakes but still those keyboards are either not to your liking and still with them you aren’t able to increase your typing speed and accuracy. 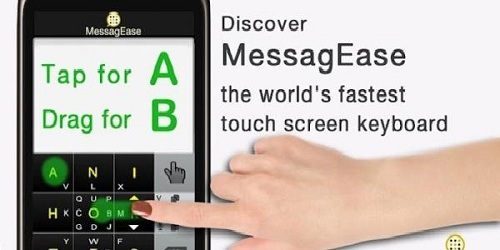 But now there is a new keyboard in the market and its called MessagEase Keyboard which aims to remove the disadvantages that are offered by other keyboards namely small keys and typos. The keys of this keyboard are larger than the other normal QWERTY keyboards which make it very comfortable to type on. Moreover the developer has claimed that it is the world’s first touch QWERTY keyboard that according to the users has managed to reduce the mistakes and also increase typing speed along with accuracy. The only downside of using this keyboard is that you have to get used to its new and unique style of typing. How Does MessagEase Keyboard Works? This keyboard was primarily developed to increase typing speed along with accuracy. to do that the keyboard has large letters meaning the keyboard has nine keys that represent several letters. Since the letters are compressed so the keys are larger thus minimizing mistakes and also preventing typos which are the case when you are using the regular QWERTY keyboards. Now you would say that what’s so special with this keyboard which looks old fashioned. The magic lies in the nine keys which show the most commonly used letters A, N, I, H, O, R, T, E, and S. These letters also represent the minor and less commonly used letters. So now if you want to type out a sentence then simply slide your finger towards the direction of the minor letter which is in either direction of the center letter. For example if you want to type V then slide from letter A towards the O key which is in the center. MessagEase keyboard is available for free in Play Store and once you get used to it you will notice that it provides you with a much better option than other premium and paid keyboard apps. Do try out and let us know how you felt using it and whether it increased your typing speed and accuracy.